Looking for the flywheel side crank seal for a Homelite 775D. It measures 11/16" ID x 15/16" OD. I've tried my local auto parts store, and eBay, both to no avail. I do not even have the part number for the seal. 2) If all else fails, there's a metric seal from Timken that may work for you with a double lip and garter spring. The OD should be good and it will be a little tighter on the shaft, about 0.018" It will be rubber coated as it's a metric seal but that coating is designed to work with mag and aluminum. Well, I guess I'll bow to your obviously superior knowledge. But I will still point out that my Owners Manual (1980, second edition) specifically states that "The carburetor is an all-position, diaphragm type having a factory-calibrated, high-speed mixture system for proper high speed performance." Without bothering to type in the next two paragraphs, I'll simply note that it says that there are only two adjustments - the "idle speed screw" and the "idle mixture adjustments". My personal experience with the Super 2 is based on just my own saw and this manual, so I am currently un-informed on whatever else they might have made after I bought the saw. 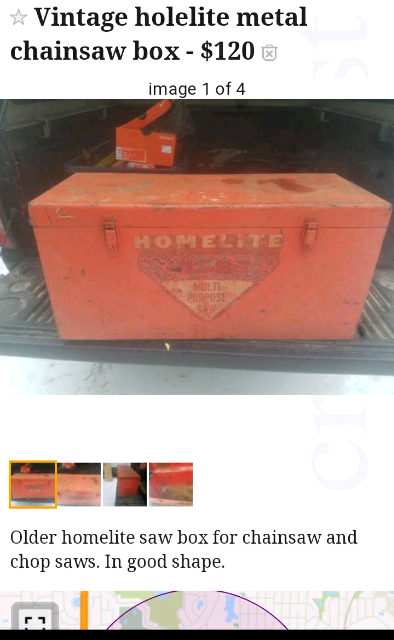 For years I thought that Homelite only made junky cheap home-owner class saws, so I never paid much attention to it - only recently have I come to realize what a gem it is. I know there are thousands of other saws that I could buy, but I love the one I have. I guess I'll keep my eye out for a replacement carburetor if such a thing exists for this model. They do indeed exsist. 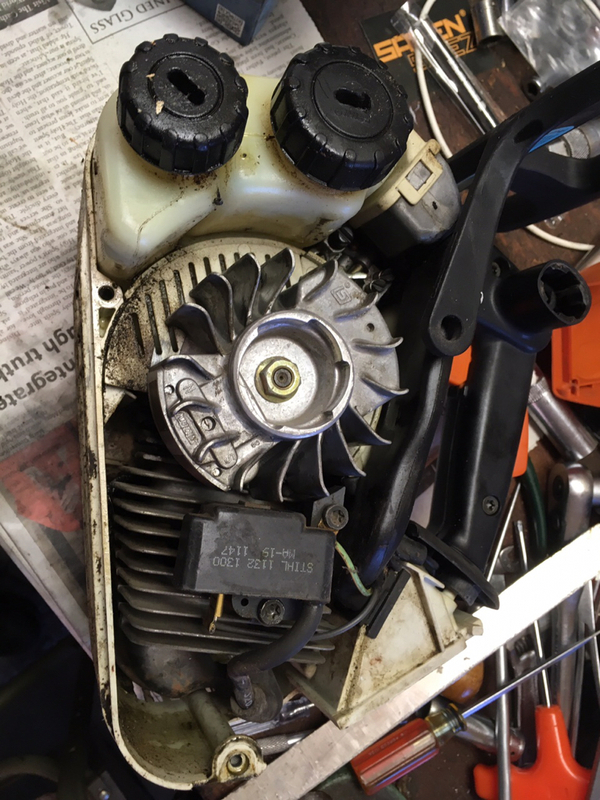 I swapped a Super EZ carb on one of mine to get a high adjustment. Think I had to change the choke lever and throttle hookup but was Super EZ. LOL. ray benson, ML12 and 95custmz like this. Cleaning a bit and ran across these Nos . Got last summer for a couple super wiz projects Bronze felling spikes ?? I need to polish them ! ML12, 95custmz and sawfun like this. Damn right you do and when you're finished I am going to send you some stuff to polish. rocketnorton, PogoInTheWoods, sawnami and 1 other person like this. Looks like a good project! Small block and go . PogoInTheWoods, sawfun and fossil like this. The Stihl 019t is a blatant copy of an XL/XL-2. Jasonrkba, ray benson, 2stroke_shaman and 3 others like this. ThistleIA and 67L36Driver like this. PogoInTheWoods and undee70ss like this. Be sure to use a little loctite on the replacements so they don’t wiggle out again. sweepleader and ChainLightn1ng like this. Are these common? This is the first I have seen that's recognizable. If I had the extra cash I'd buy it. Love that stuff. So, then I looked closely at the ad and all the internal dividers have been cut out, just dropped to about $20 in my book. Mauser, undee70ss, Drptrch and 1 other person like this. No gasket. Need a IPL? See link. Trying to find a build date on my new EZ? PogoInTheWoods and Drptrch like this. September 29, 1978, maybe. The tag is curled up and the end is not visible in the picture. The date should be correct if there is only one more digit on the tag not visible. ray benson, Jasonrkba and sawfun like this. Just picked up a Super EZ and SXL925 over the weekend. The EZ Runs great but I pulled the muffler off the 925. How bad is it? Also, can anyone identify the bar on it? Looks like an old Sugi? The EZ came with a 20" bar and the 925 a 24" bar. UT for the 925 is 10510A instead of the usual 10415.
sawfun and 95custmz like this.